The Rajasamand district was carved out from the erstwhile Udaipur district and was constituted on 10th April 1991. The beautiful region is named after the famous lake of “Rajsamand”. The beautiful district features a rich religion, culture, history and has a large number of mining industries. The place is also significant since it is the birthplace of Maharana Pratap. 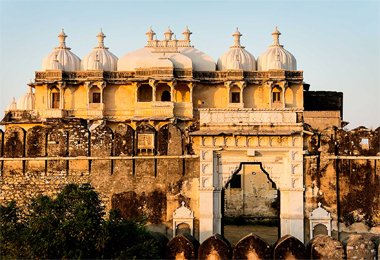 Other famous tourist attractions scattered around the place are the famous Haldighati battle field, Shrinathji the chief deity of Vaishnav religion, Charbhuja and the Dwarikadheesh temple. Being a historically significant region its length and breadth are dotted with large number of forts and palaces, some of which have been converted into heritage hotels to allow the travelers experience the old world charms and royal legacy of the bygone years. These heritage hotels are appointed with all modern day facilities to cater to the needs of the modern day traveler. The majestic décor of the rooms offer a perfect lodging to relax and rejuvenate in the calm surroundings. Also enjoy lip smacking food served in the royal manner. For all this do visit and stay for a couple of days in the Heritage hotels in Rajsamand. Booking stay at Heritage hotels in Rajsamand through HeritagehotelsofIndia, an online portal one can avail great discounts.